Swiss industrial metal group offers a middle-of-the-road release that expands their sound and has plenty of upside. When a band is named Sybreed, it's pretty easy to guess what their predominant themes will be. The Swiss quartet has been playing Fear Factory-inspired industrial metal since their inception in 2003, gaining a fair amount of notice in Europe with the albums Slave Design and Antares (the latter of which featured session drums by Soilwork/Aborted skinsman Dirk Verbeuren). Guitarist Thomas "Drop" Betrisey has also earned some recognition as an excellent remix artist, creating remixes for both Celldweller and Soilwork in recent years. Back now with their third album, The Pulse of Awakening, Sybreed focuses on expanding their sonic capabilities while still holding true to their core sound. They are successful in both areas, although there are certainly things that could have been improved as well. Musically, this album is the most diverse offering yet from Sybreed. The core sound still draws on Digimortal and Archetype-era Fear Factory, heavily focused in synth and guitar effects with lots of technical, complex drum patterns worked in. However, while both of the band's previous albums adhered to the heavier end of the spectrum, on The Pulse of Awakening the band expands on certain songs, into more pop-focused riffs and hooks. The result will draw a lot of comparisons to Sybreed's Danish counterparts in Mnemic and Raunchy, both of whom use catchier hooks to enliven their songs in certain areas. Bear in mind that this does not mean the band has abandoned heaviness entirely, as "A.E.O.N." and "I Am Ultraviolence" are two of the heaviest songs ever written by Sybreed. The album is well-balanced and well-composed in that aspect. There are two problems with this record, though. The first is vocalist Benjamin Nominet, who still hasn't exactly figured out parts of his voice. His screams are undoubtedly excellent, with better technique than anything heard before from him. However, his clean singing still lacks the confidence and inflection needed to be truly profound and evocative. Nominet definitely has a recognizable voice, and his delivery is quite unique among his contemporaries. But some of the heavier processing added to the vocals detracts from what could potentially be a very moving performance. Second, the album falls into a fairly predictable pattern of heavy vs. light as it continues. Only at one point on the album does a heavy song immediately follow another heavy song, and such repetition never happens with a light song. However, this pattern is less of a problem because of how good the compositions are. And there is enough variation in the compositions for the album to stay interesting despite the formula. 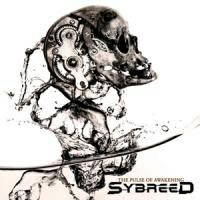 The Pulse of Awakening is a pretty strong industrial album and definitely should give Sybreed a boost in popularity. While it doesn't have the sheer, unadultered power of Fear Factory's Mechanize or the ear-yanking catchiness of Mnemic's Sons of the System, The Pulse of Awakening offers a fair balance between the two ends of the spectrum and is a good addition to the very small industrial metal community. Given more time and greater exposure, Sybreed could very easily attract a devoted course fanbase in the US with their catchy but still heavy cyber-blend.